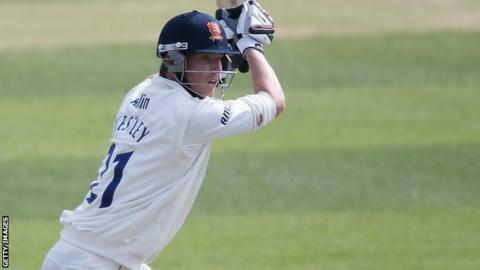 Essex will enter the last week of the County Championship believing they have the ability to be be a Division One team, says batsman Tom Westley. The Chelmsford side are battling with Hampshire for the right to join leaders Worcestershire in Division One. Hampshire have a 10-point advantage as they face Glamorgan in Cardiff, while Essex host Worcestershire. "In a few years' time, we feel we can kick on and develop into a successful four-day team," Westley told BBC Essex. "Promotion means everything to us... at the start of every year we identify that we want to be in Division One." "We believe we have the squad to play Division One cricket." Essex last won promotion from Division Two in 2009, but suffered immediate relegation the following year. The club have developed a reputation for being one-day specialists, with a total of five titles from the old Pro40 and Friends Provident competitions, but they also have six County Championship successes to their name. Essex start their four-day game against already-promoted Worcestershire on Tuesday as they look to make up the deficit on Hampshire, with a maximum of 24 available. "Promotion means everything to us," said 25-year-old Westley, who has averaged 30.52 this season. "We've been successful in white-ball cricket in years gone by. But at the start of every year we identify that we want to be in Division One."